A dental implant is a "root" device, usually made of titanium, used in dentistry to support restorations that resemble a tooth or group of teeth to replace missing teeth. 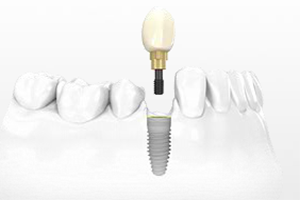 Virtually all dental implants placed today are root-form endosseous implants, i.e., they appear similar to an actual tooth root (and thus possess a "root-form") and are placed within the bone (endo- being the Greek prefix for "in" and osseous referring to "bone"). The bone of the jaw accepts and osseointegrates with the titanium post. 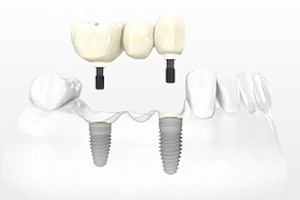 Osseointegration refers to the fusion of the implant surface with the surrounding bone. Dental implants will fuse with bone, however they lack the periodontal ligament, so they will feel slightly different than natural teeth during chewing. 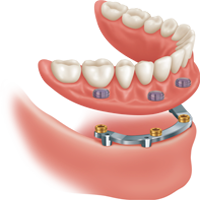 Prior to the advent of root-form endosseous implants, most implants were either blade endosseous implants, in that the shape of the metal piece placed within the bone resembled a flat blade, or subperiosteal implants, in which a framework was constructed to lie upon and was attached with screws to the exposed bone of the jaws. 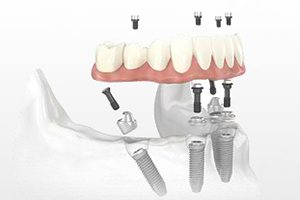 Dental implants can be used to support a number of dental prostheses, including crowns, implant-supported bridges or dentures. They can also be used as anchorage for orthodontic tooth movement. 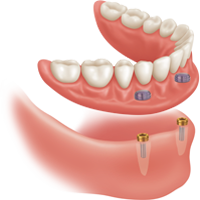 The use of dental implants permits undirectional tooth movement without reciprocal action. © 2012 Greenville Dental Lab, Inc.